The leader of Rotherham Council today backed the announcement from South Yorkshire Police that it is looking to use the law to end ‘far-right’ protests. The police claim resources to protect victims of crime are instead being used to meet the constant demand to police repeated protests. “Since October 2012 we have policed 20 protests in South Yorkshire, 14 of which have focused on Rotherham. “Whilst we respect all individual’s right to protest we must balance this against local people’s right to enjoy their town centre, the businesses’ right to trade and the need to fund wider policing. “I’m now seeking specialist legal advice to explore all our options around these protests. We are facing a situation the legislation what not designed to address. 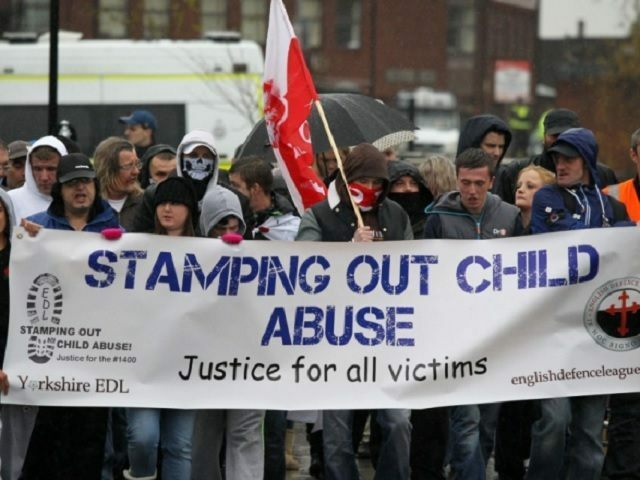 The majority of the protests in Rotherham have been organised by groups including the English Defence League and Britain First, looking to protest over the grooming gang child exploitation scandal. That scandal, which has now been revealed to the public, resulted in as many as 1,400 girls being abused by men, mostly of Pakistani heritage, over a 16 year period during which time authorities turned a blind eye. The anti-grooming protests have regularly been met by counter demonstrations by groups such as Unite Against Fascism, generally held on the same days meaning authorities have had to draft in extra officers and even reinforcements from neighbouring forces. To date police say up to £4 million pounds has been spent on managing the protests, not including any subsequent criminal investigations which can follow. “We acknowledge and respect that people – the vast majority of them from outside of Rotherham – have used their right to protest, and they’ve done so repeatedly. However, the protests have frightened people away from our town centre, they’ve damaged our local economy, and they haven’t added anything to the very serious work that’s being done to restore the council, tackle child sexual exploitation and to secure justice for those victims who have been let down. “The Secretary of State has appointed Commissioners to take Rotherham forward, because of the failings of the past. These continued marches serve no purpose, are impacting on our progress, and are putting at risk some of the good work that has been done on regenerating the town. “Our local communities and businesses have been very tolerant, and more than anyone have the right to be angry about the failings of the past. “They themselves are now saying that enough is enough. We want to help re-build Rotherham’s reputation, bring communities together, and build on the strengths of the town. “…Every protest diverts funds which could be better used not least in supporting more work in protecting vulnerable people. The Chief Constable declared his “respect” for “all individual’s right to protest”, a view parroted by the leader of Rotherham Council, the government-appointed commissioner reforming that body and the South Yorkshire Police and Crime Commissioner. Despite their public respect for the right, all four agree that the time has now come to curtail it.